Chain 6. Join with sl st to form ring. Ch 3 (counts as 1 dc), work 13 dc into ring. 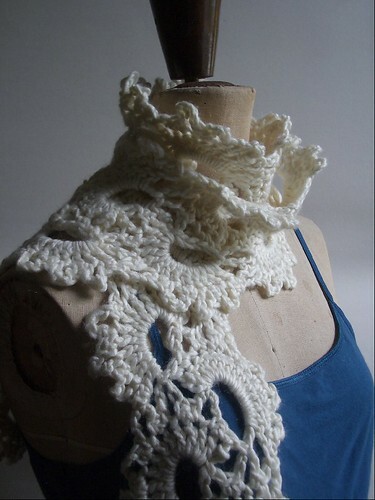 If you purchased the Anne Crochet Lace Scarf pattern between February 08, 2008, and February 18, 2008, you received a version with an error in it. The pattern had been reformatted for a print run, and in the process, a line of text was accidentally deleted. My apologies for any difficulties this may have created in your crocheting! An email with a corrected PDF was sent out; if you did not receive the email, please contact me and I will send you the corrected PDF. Again, this is only for those who purchased the pattern between February 08, 2008, and February 18, 2008. If you purchased the pattern before February 08, 2008, or after February 18, 2008, you do not need the corrected version. One of my goals with the Anne scarf pattern was to take something basic and show how different yarn and hook choices can change the look. I'm sure it's no surprise to you that it can change the cost rather dramatically too. Prices will vary depending on the vendor, cost of shipping if ordered online, etc., and are of course subject to change without notice, so take this list with that in mind. Prices given are for the total number of skeins, not yardage (for example, with the Cascade 109 Chunky it is assumed that you will purchase 2 skeins even if you only use 1.5 skeins). Yarn weight is given as general terms (laceweight, worsted, etc.) and CYCA Yarn Standards (1, 4, etc.). I wanted the pattern to be possible as a one-skein project, and if you use the Blue Sky Alpacas Dyed Cotton called for in the pattern, it is. Turns out it can even be a less-than-one-skein project with the Elann Super Kydd. 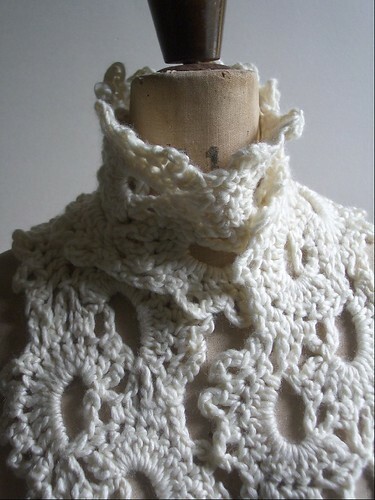 The crochet pattern (with full written instructions and a symbol chart) can be purchased as an instant PDF download for $5.50 (USD) through Ravelry with a PayPal account, credit card, or debit card (please note that eCheck payments take 3 - 7 days to clear, and the download will not be sent until payment clears). If you'd prefer, the PDF downloads are also available through my Etsy shop (mkcarroll.etsy.com) - download link will be emailed within 24 hours of payment clearing. If you'd prefer a finished item, check the Sample Sale section of my Etsy shop. Ideally, I'd use another half skein to make this a bit longer.